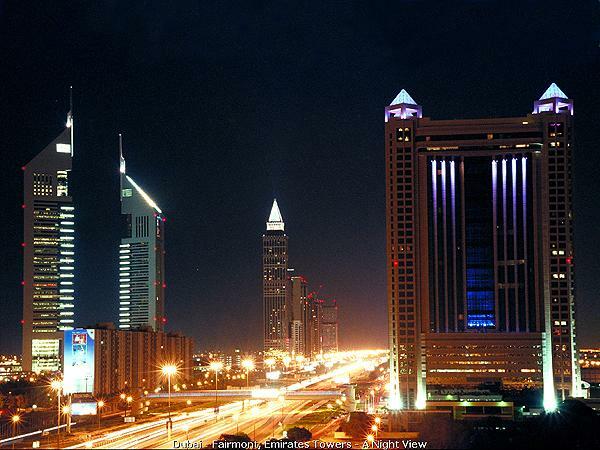 Situated in the NE of the country, Dubai is one of the 7 emirates that comprise this country. 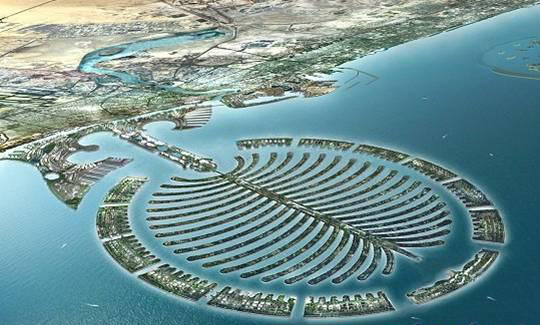 Dubai is 120 klm NE of Abu Dhabi city and is set directly on the Persian Gulf occupying level terrain. It is bisected by Dubai Creek (also known as the Khor Dubai), which is really a deep-water inlet. The area consists of flat desert surrounds; a great expanse of sand dunes stretches away to the S, and the rugged Hajar Mountains rise to the E.
Without doubt the most popular tourist venue in the UAE, Dubai is a wealthy, cosmopolitan, multicultural and multinational city that combines the glamour and entrepreneurial panache of Hong Kong with the flamboyance of Las Vegas, all served up with an Arabian flourish. This liberal, tolerant destination has what it takes to have a good time, with big-time horse races and sporting events, first-class tax-free shopping, fine beaches lapped by the Gulf’s warm waters, guaranteed sunshine and lively nightlife. With its array of striking, ultramodern architecture and brisk pace of life, the casual observer can be forgiven for thinking that the city is entirely a modern creation; the fact is that the location has been inhabited for well over 2 millennia, and old minarets, mosques and traditional dwellings can be found dotted about the older portions. The city hugs the coastline for about 15 mls (being about 5 mls at its widest), and comprises 2 main parts: Bur Dubai (the original section) and, on the opposite side of Dubai Creek, Deira, now the city centre. Along the coast to the SW of the centre lies Jumeirah, a residential area that’s home to many Western ex-pats. Around the airport on the NE side of Dubai Creek is Al-Garhoud, a select suburban area. Dubai is becoming increasingly popular with middle- to upmarket Western tourists seeking a hot, sunny shopping and sunbathing haven. Large numbers of international business people also flock here due to it’s well catered business environment. 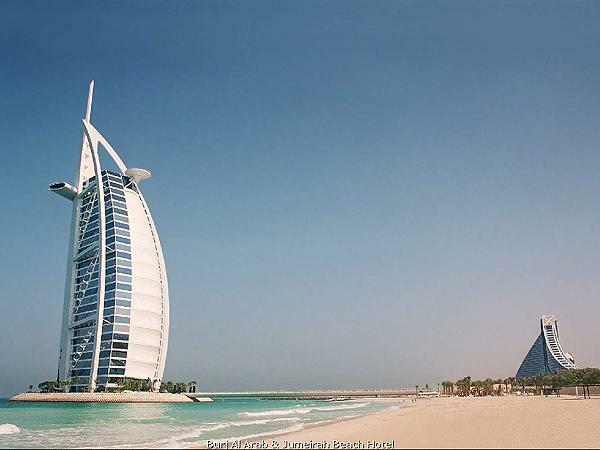 Dubai also hosts arguably the world’s most luxurious (7 star) hotel (Burj al Arab Hotel). There are more than 2 dozen de luxe hotels and modern apartment complexes, as well as more modest properties in and around the city centre. 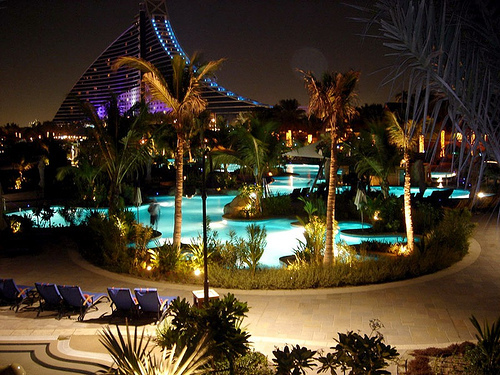 Many of the most modern, luxurious establishments are dotted along the very extensive sandy shoreline (Jumeirah Beach) to the SW; most are well equipped and stylish, with their own in-house entertainment. Although the city itself has a sandy shoreline broken only by the mouth of Dubai Creek, broad Jumeirah Beach to the SW is the resort’s premier location: uncrowded, with gently shelving, soft, pale sands and warm clear water stretching for over 8 mls; numerous breakwaters flank the hotels’ private sections, making bathing safer. All kinds of water sports are available including pedalloes, water-skiing, windsurfing and diving. Dubai really is an upmarket shopper’s paradise. Fine jewellery, gold, watches, designer labels, fabrics, Persian carpets, sports gear, consumer electronics and even cars, often at incredibly low prices (thanks to low customs duties). A proliferation of large air-conditioned shopping malls, plus more conventional street parades and centres. A number of traditional souks; the Gold Souk, with its plethora of Arabian, Indian and SE Asian wares, is an experience in itself, and one of the largest retail gold markets in the world. Haggling is de rigueur, and watch your back pocket. Prized local products include Arabian coffee pots, silver and brass swords and khanjars (curved daggers), shisha pipes, porcelain prayer beads, antique silver jewellery, brass trinkets, model sailing ships of silver and wood, and high-quality wooden furniture. Nightlife is varied and surprisingly lively, with lots of bars and clubs (most based in hotels in order to serve alcohol). Most nightclubs have cover charges, and drinks tend to be expensive. Just about every bar in town has live music or a DJ. A few jazz bars and piano lounges. Thursday nights are the busiest, and most bars and clubs close by about 3 am. Little in the way of performing arts; some traditional entertainments, such as belly-dancing. Entertainment is found generally in the traditional quarter of Bastakiya. The Dubai Museum, housed in an old fort, provides an entertaining interactive introduction to the city’s history. The Sheikh Saeed al-Maktoum House, a history and culture museum. 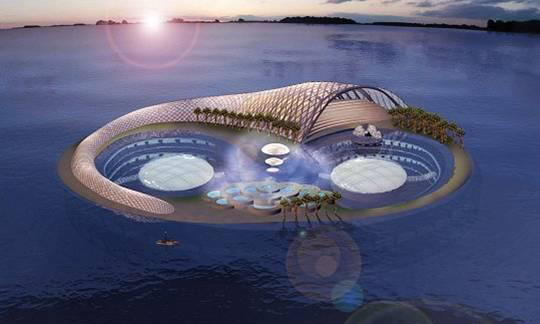 The Dubai Heritage and Diving Village (traditional culture). Numerous souks. Several mosques. Trips aboard dhows (traditional sailing vessels). Super beaches and varied water sports. Amusement park; water park. Shopping. Horse and camel riding. Scuba diving. Horse racing. Exclusive golf clubs. Small zoo at Jumeirah. Eating out is truly cosmopolitan, ranging from familiar Western fast-food chains and pizzerias to fine dining, including Italian, German, Indian, Chinese, Thai, Lebanese and other Arabian cuisine. The cost of dining and drinking in hotel restaurants tends to be on a par with the same in London. Kebabs and Indian fare are plentiful in the streets, and very cheap. Shopping malls have large food halls. Getting around is fairly easy and the city’s public buses are air conditioned and frequent, with extensive coverage; they can, however, get crowded. Abundant metered taxis are cheap. It is entirely safe for women to travel alone. Reputable car hire is readily available. Nearly all roads are 4- to 8-lane dual carriageways; traffic is fast and heavy, with traffic jams common throughout the day. English-language signposts make things easier, but local driving style leaves a lot to be desired. Ditch the car and take a cab. Local excursions consist of Dubai city tour; Sharjah city tour; sand skiing; hiking tours in the mountains and desert; bird-watching; charter boats; deep-sea fishing; traditional village of Hatta (60 mls). Full day: the city of Al Ain; Abu Dhabi; 4-wheel-drive desert safari; overnight Arabian safaris/camping.